A Swedish gaming nerd gets twice the viewership on YouTube as the top rated show broadcast television show in North America. Consumers don’t shop for plane tickets just by price, but by the level of agony they’re willing to endure for the amount they’re willing to pay. 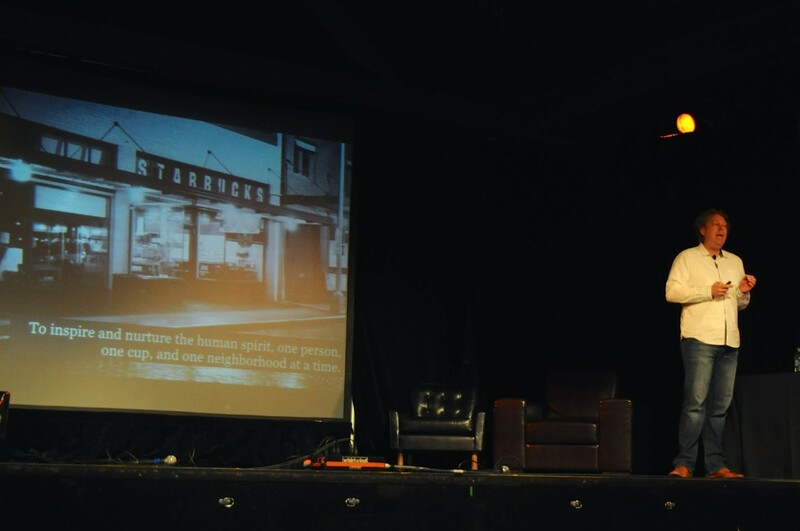 These, among other developments, indicate just how wildly consumer engagement paradigms are shifting for businesses, and are a huge part of why attendees came to hear from a multitude of digital communication thought leaders at day 2 of IN-NW, held at the Showbox SoDo in south Seattle. As the day’s emcee, Hanson Hosein, put it, “We’ve hit critical mass,” and are now wondering when the digital revolution will hit, but rather, what can we do now that it’s here? In a digital world where down is the new up, how do individuals and companies not only adapt, but thrive? Of course, there probably is no universal answer to that question, but IN-NW attendees certainly got to hear about more than their fair share of options, and challenges, from a wildly diverse group of experts. For Seattle design and development company, Artefact, it means taking a different approach to internal organization. As Artefact UX Designer Olen Ronning explained, everyone in the company reports to the same two people, its founders, giving the company a “flat” organization that allows for much greater focus on peer feedback, and the cycle of continuous improvement. And, as Susan Howe, president of Weber Shandwick‘s Global Consumer Marketing practice said, that cycle is facilitated by solid strategies and commitment more than it is with any tool. A later talk from Maria Harley, vice president of operations for Gravity Payments, shed light on their recent decision to very purposefully improve their company, and the lives of their employees, by implementing a $70,000 minimum salary for all. As Harley said, Gravity maintains a highly entrepreneurial culture, which the $70,000 move is both indicative of, and, hopefully, will further foster. And while Harley acknowledged an audience member’s comment that a similarly drastic increase in compensation is likely unachievable for most organizations, she believes “the spirit of $70,000 absolutely is.” And the spirit, Harley said, is about understanding what your resources your organization can leverage to make its employees lives better. Nina Morrison, vice president of community & customer relations for Talking Rain, detailed how, in the company’s early days, community engagement meant leveraging the only plentiful resource they had – water. They provided water for all manner of marathons and races, an organic alignment of social purpose and resources that served as the foundation for major corporate responsibility initiatives to come. Those efforts now extend as far as building schools in the Dominican Republic and, just days ago, sponsoring Mariners star Robinson Cano’s presence at a little league game on Mercer Island. In a conference highlight, multi-hyphenate rappers, designers, and all-around-creative dudes Nick Beeba and Parker Joe from Possi recounted the story of creating Heartless, a Valentine’s day themed pop-up party in Seattle that was designed to be more fun than typical V-day fare. With Seattle hardly known for its pop-up ragers, they had their work cut out for them in both creating and promoting the event. Fortunately, they had a strong community of support to leverage, and leverage it they did, working connections for everything from artistic guidance on the promotional campaign to event sponsorship from Modelo. After obtaining major community involvement in social media promotion, especially an innovative campaign on Instagram (a platform they described as “today’s newspaper”), Heartless almost gained too much traction. The party became a smash hit, which the Possi team largely attributes to finding just the right mix of community engagement in the digital build-up that then paid off with a uniquely satisfying “real-life” experience. Any presentation that started with an emoji video of “Drunk in Love” was bound to be a hit. But when the laughter at the example of effective emoji communication died down, Ross Asdourian, creative director of branded content for NBCUniversal News Group, expounded on the hard work of integrating modern digital engagement techniques into legacy media organizations with color and candor. How does an organization like NBC that’s typically, as he put it, about “being right, rather than being first,” respond to a chaotic media landscape in which the reverse is increasingly prized? For Asdourian, the key is to create data driven experiences that connect the dots between digital and real-life, and also resonate authentically no matter if it’s a “branded” experience on a news site, or traditional journalism. Rounding out the day, Megan Tweed, digital senior vice-president at Edelman crystallized the challenges facing organizations in how they approach storytelling. 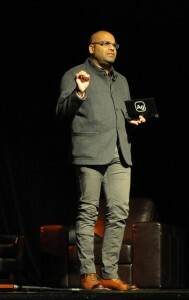 “Modern brand storytelling has definitely changed,” Tweed said. And with more brands popping up every day, alongside individuals essentially “branding” themselves, the challenge to cut through the noise increases exponentially. “Your brand is only relevant in as much as it creates value,” she said. Tweed highlighted data, and data management, as a huge “superpower” in creating stories and experiences that resonate with consumers. With the internet of things an increasingly tangible reality, tools and technologies exist to leverage data in creating “incredibly tailored” storytelling campaigns and advertisements to consumers. As Tweed put it, brands that understand technology “blow up silos” and are doing the most meaningful work in creating stories that stick with their customers. 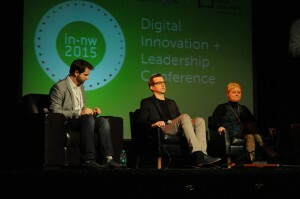 With sixteen speakers in all, the mind boggled by the end of the day at all the insights, tips, takeaways, and stories from day two of IN-NW 2015. Which, if anything, seems fitting – a conference on digital leadership and innovation proved to be every bit as jam-packed with content as our new-normal lives.